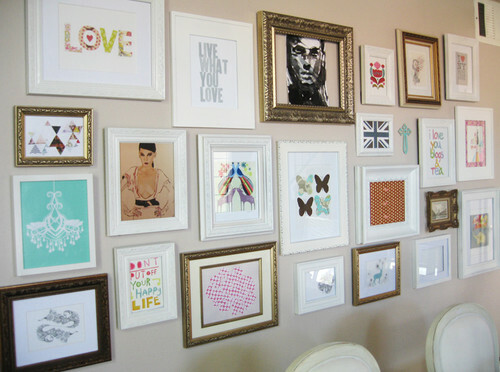 A gallery wall is one of the hardest things to DIY when it comes to home decorating. Should you include photos and artwork? 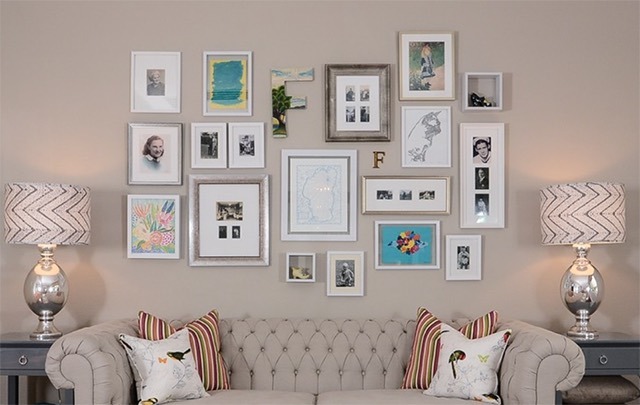 Should you match sizes and frames, or get more creative and mix things up? If you do want to branch out from a simple row or grid pattern, how do you do it without it looking messy? And should all of this be placed against a happy paint color or is it better to keep the paint neutral? To get the answers, I turned to interior designers who have created beautiful gallery walls that are both highly creative and well organized. The art on this bedroom wall by Laura Weatherbee of L. Weatherbee Design Studio is beautifully anchored by the pale blue paint color behind it. (It’s 7532 Glorianna from Cloverdale Paints.) I like the way she alternated photos that were shot long-range with ones shot close up. By placing this gallery above the headboard, it draws more attention to it. Other juicy details: The Tufted Wingback Linen Headboard is from Wayfair. To find out how Weatherbee created a custom DIY ombre finish on the lampshades, read her article here. >>Check out the great picture frames at Wayfair! 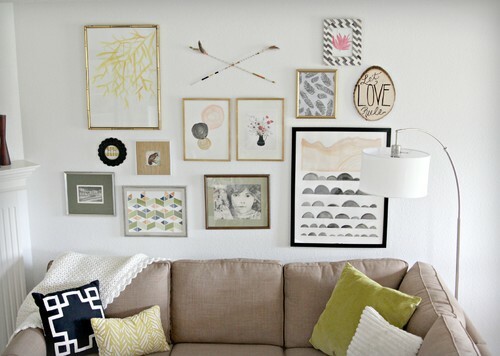 Design by Heather Freeman Design Co.
Frames on a wall don’t have to match. 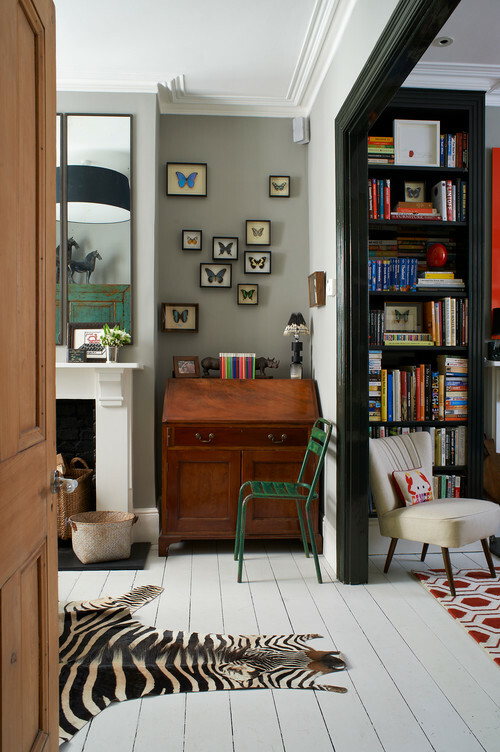 Black, silver, wood and painted frames of various sizes can all be beautifully added to the same wall. >> Check out my article on dining room table centerpieces for everyday! 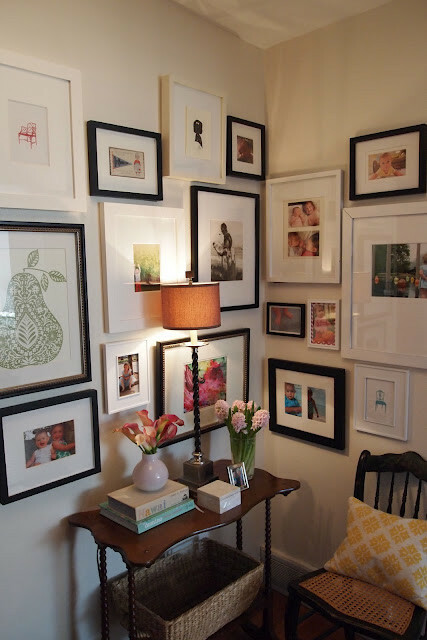 Gallery walls can be added to any nook in the house . . . [they] don’t need to be clustered. Here, too, the neutral wall color anchors the artwork. In this case California designer Kerrie L. Kelly of Kerrie Kelly Design Lab mixed artwork with the letter F to create interest above the tufted Chesterfield sofa. >>Here are letters and numbers you can buy from Michael’s! We use every inch of our house and we use it well. That’s clear from this area alone! Read her article to find out exactly how she did it, including taping pieces of newsprint up in advance to see how it would look. This wall is actually in the Laurel Canyon Music Studio, but you could do the same thing at home. 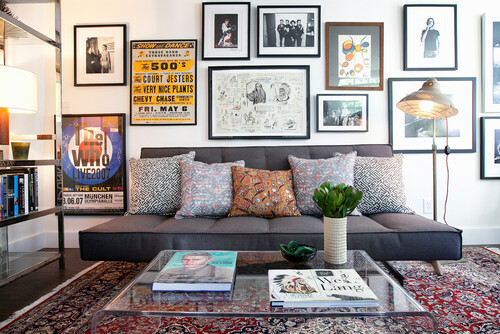 Los Angeles design firm Lindsay Pennington Inc. combined posters, photos, and hand-drawn art to make a highly creative-looking area. Other juicy details: The coffee table is from CB2. The pillows are from the LA store Hollywood at Home, and the fabrics (except the center, which is vintage) are by ZAK+FOX. Here are some layout templates. Please share this infographic if you like it! Have gallery wall questions? Leave a comment and I’ll find the answer!